It has been requested that the title of this article be changed to Reiwa. Please see the relevant discussion on the discussion page. The page should not be moved unless the discussion is closed; summarizing the consensus achieved in support of the move. The Reiwa period (Japanese: 令和時代, Hepburn: Reiwa jidai) will be the next era of Japan. The period is expected to start on 1 May 2019, the day when Emperor Akihito's elder son, Naruhito, is expected to ascend to the throne as the 126th Emperor of Japan. Emperor Akihito is expected to abdicate the Chrysanthemum Throne on 30 April 2019, marking the end of Heisei period. The year 2019 corresponds to Heisei 31 until 30 April, and Reiwa 1 (令和元年, Reiwa gannen, "the first year of Reiwa") from 1 May 2019. The day after the announcement, the government revealed that the other candidate names under consideration had been Eikō (英弘), Kyūka (久化), Kōshi or Kōji (広至), Banna or Banwa (万和), and Banpo or Banhō (万保), three of which were sourced from two Japanese works, the Kojiki and the Nihon Shoki. 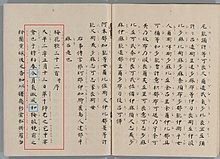 Official pronunications of these names were not released, although the reading of Eikō was leaked; the other readings are speculative. 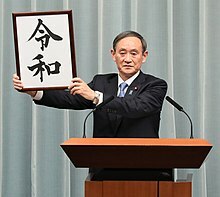 The Japanese government announced the name during a live televised press conference, as Chief Cabinet Secretary Yoshihide Suga traditionally revealed the kanji calligraphy on a board. Prime Minister Shinzō Abe said that Reiwa represents "a culture being born and nurtured by people coming together beautifully". And the fragrance of the orchids was their sweet perfume. The Japanese Foreign Ministry provided an English-language interpretation of Reiwa as "beautiful harmony", to dispel reports that "Rei" (令) translated as "command" or "order". However, the Foreign Ministry also noted that "beautiful harmony" is neither an official translation nor legally binding. In addition, the characters mark the first time a Japanese era name with characters that were taken from Japanese classical literature instead of classic Chinese literature. [better source needed] The Chinese foreign ministry responded to a question related to this matter from Japanese media saying that it is Japan's internal affair to choose an era name but expressed good wishes concerning the Sino-Japanese relationship. When the wind is mild and the air clear. And the hundred grasses become rank and thick. Robert Campbell, director-general of National Institute of Japanese Literature in Tokyo, provided an official televised interpretation to NHK national broadcasting group organization, regarding the characters based on the poem,[clarification needed] noting that "Rei" is an auspicious wave of energy of the plum blossoms carried by the wind, and "Wa", the general character of peace and tranquility. Accordingly, the name marks the 248th era name designated in Japanese history. While the "wa" character 和 has been used in 19 previous era names, the "rei" character 令 has never appeared before. According to the Japan Mint, which is responsible for producing Japanese currency, all coins with the new era name will be released by October 2019. It takes three months to do preparations such as creating molds in order to input text or pictures. The Mint will prioritize creating 100- and 500-yen coins due to their high mintage and circulation, with an anticipated release by the end of July 2019. Anticipating the coming of the new era, in September 2018, the Unicode Consortium reserved a code point (U+32FF ㋿ SQUARE ERA NAME REIWA) for a new glyph which will combine half-width versions of Reiwa's kanji, 令 and 和, into a single character; similar code points exist for earlier era names, including Shōwa (U+337C ㍼ SQUARE ERA NAME SYOUWA) and Heisei (U+337B ㍻ SQUARE ERA NAME HEISEI) periods. The resulting new version of Unicode, 12.1.0, is scheduled to be released on May 7, 2019. ^ "新元号「令和（れいわ）」　出典は万葉集" (in Japanese). 1 April 2019. Retrieved 1 April 2019. ^ McCurry, Justin (1 April 2019). "Reiwa: Japan prepares to enter new era of 'fortunate harmony'". The Guardian. Retrieved 1 April 2019. ^ "New Japanese imperial era Reiwa takes name from ancient poetry". Reuters. 2019-04-01. Retrieved 2019-04-01. ^ Rich, Motoko (1 April 2019). "Japan's New Era Gets a Name, but No One Can Agree What It Means". The New York Times. Retrieved 1 April 2019. ^ "「元号」有識者懇メンバー9人発表 " (in Japanese). Mainichi Shimbun. 1 April 2019. Archived from the original on 1 April 2019. Retrieved 1 April 2019. ^ a b c d "Japan names new imperial era beginning May 1 "Reiwa"". Kyodo News. 1 April 2019. Retrieved 1 April 2019. ^ a b c d "新元号 ６原案中４つは 「英弘」「広至」「万和」「万保」". NHK News Web (in Japanese). 2019-04-02. Retrieved 2019-04-07. ^ "Banna, Banpo, Eiko, Koshi and Kyuka: The Japan eras that could have been, beaten out by Reiwa". The Japan Times. 2019-04-03. Retrieved 2019-04-11. ^ a b c d Baseel, Casey (2019-04-03). "4 era names the gov't rejected before deciding on Reiwa". Japan Today. Retrieved 2019-04-06. ^ "新元号 ６案すべて判明 「令和」考案は中西進氏か" (in Japanese). NHK News Web. 2 April 2019. Retrieved 2 April 2019. ^ "「令和」考案は中西進氏　古事記・日本書紀含め、3案が国書典拠" (in Japanese). ^ "Japan reveals name of new imperial era will be 'Reiwa'". BBC. 1 April 2019. Retrieved 1 April 2019. ^ Yamaguchi, Mari (1 April 2019). "Japan says name for new era of Naruhito will be 'Reiwa'". The Washington Post. Retrieved 1 April 2019. ^ "新元号「令和」　首相談話「花を大きく咲かせたい」". Nikkei (in Japanese). 2019-04-01. Retrieved 2019-04-01. ^ "Japan assures world that Reiwa is all about 'beautiful harmony' and has nothing to do with 'command'". The Japan Times. April 3, 2019. ^ Osaki, Tomohiro (1 April 2019). "Reiwa: Japan reveals name of new era ahead of Emperor's abdication". The Japan Times Online. Retrieved 1 April 2019. ^ "新元号は「令和」（れいわ）　万葉集典拠、国書由来は初". 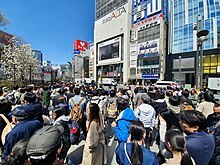 Asahi News Digital (in Japanese). 2019-04-01. Retrieved 2019-04-02. ^ Zhang, Ao (2019-04-01). "日本新年号未出自中国典籍，中方怎么看？外交部这样回应". Global Times (in Chinese). Retrieved 2019-04-02. ^ Ozawa, Satoshi (2019-04-01). "「日本が困難な時、万葉集がはやる」　令和は歴史的転換". Asahi News Digital (in Japanese). Retrieved 2019-04-02. ^ Liu, Wu-chi (1990). An Introduction to Chinese Literature. Westport, Connecticut: Greenwood Press of Greenwood Publishing Group. p. 54. ISBN 0-313-26703-0. ^ "Japanese Literature Expert on New Era Name". NHK World Japan. 1 April 2019. Retrieved 2 April 2019. ^ "Japan announces "Reiwa" as new era name to begin under new emperor". Xinhua. 1 April 2019. Retrieved 1 April 2019. ^ "Japan's govt. chooses 'Reiwa' as new era name". NHK World Japan. 1 April 2019. Retrieved 1 April 2019. ^ "「令和」の硬貨はいつ発行される？免許証、書類はどうなる… | ページ 2". bizSPA!フレッシュ (in Japanese). 2019-04-02. Retrieved 2019-04-03. ^ Lunde, Ken (1 April 2019). "Adobe-Japan1-7 Published!". CJK Type Blog. Adobe. Retrieved 2 April 2019. ^ "New Japanese Era". The Unicode Blog. Unicode Consortium. 2018-09-06. Retrieved 1 April 2019. ^ "Unicode 12.1.0". The Unicode Consortium. Retrieved 2 April 2019. Look up 令和 in Wiktionary, the free dictionary.